"Golgotha" redirects here. For other uses, see Golgotha (disambiguation). Not to be confused with cavalry. For other uses, see Calvary (disambiguation). 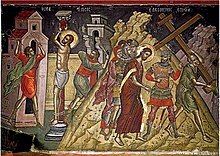 Golgotha, or Calvary (Biblical Greek Γολγοθᾶ[ς] Golgotha[s], traditionally interpreted as reflecting Syriac (Aramaic) golgolta, as it were Hebrew gulgōleṯ (גולגולת), "skull"), was, according to the Gospels, a site immediately outside Jerusalem's walls where Jesus was crucified. 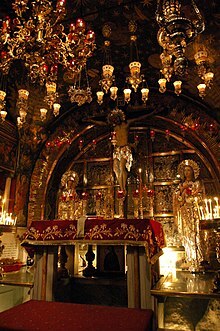 Matthew's and Mark's gospels translate the term to mean "place of [the] skull" (Κρανίου Τόπος Kraníou Tópos), in Latin rendered Calvariæ Locus, from which the English word Calvary derives. Its traditional site, identified by Helena of Constantinople, the mother of Constantine I, in 325, is at the site of the Church of the Holy Sepulchre. A 19th-century suggestion places it at the site now known as Skull Hill, some 500 m to the north (200 m north of Damascus Gate). Historian Joan Taylor bases a location c. 175 metres south-southeast of the traditional site on her reading of textual evidence. The recorded form Γολγοθα may be a simplified pronunciation of an Aramaic golgolta, corresponding to Hebrew gulgōleṯ (גֻּלְגֹּלֶת) "skull". English Calvary is the anglicized form of the Latin gloss from the Vulgate (Calvariæ), to refer to Golgotha in Luke 23:33, where the Greek text gives Κρανίον rather than the explicit Κρανίου Τόπος of Matthew 26:33 and Mark 15:22. The adoption the Latin form has a long tradition in English Bible translations, going back to at least the late 10th century (Wessex Gospels), and is retained in Wycliffe's Bible and Tyndale's Bible as well as in the King James Version. By contrast, Luther translates Luke's Κρανίον into German as Schädelstätte ("place of skull(s)"). The Latinism is also current in various other languages within the Latin sphere of influence, including Spanish and Italian Calvario, French Calvaire, Polish Kalwaria, Lithuanian Kalvarijos. The church fathers offer different interpretations for the name; either deriving it from a topographic feature resembling a cranium (Pseudo-Tertullian), or alternatively as the site where the skull of Adam was said to be buried (Origenes), or from the skulls of those executed there (Jerome, locum decollatorum). The association of the site with the "skull of Adam" is expanded in a number of noncanonical Christian writings, including the Kitab al-Magall, the Conflict of Adam and Eve with Satan, the Cave of Treasures, as well as by Patriarch Eutychius of Alexandria (9th century). 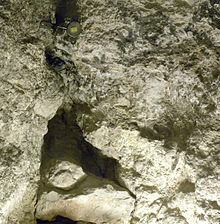 According to these accounts, Shem and Melchizedek traveled to the resting place of Noah's Ark, retrieved the body of Adam from it, and were led by Angels to Golgotha – described as a skull-shaped hill at the centre of the Earth, where also the serpent's head had been crushed following the Fall of Man. While the Gospels merely identify Calvary as a "place" (τόπος), Christian tradition since at least the 6th century has described the location as a "mountain" or "hill". An alternative suggestion, due to Krafft (1846) proposes that the reported association with the word "skull" is a popular etymology of an original name Gol Goatha, interpreted (by Krafft) as meaning "heap of death", or "hill of execution"; the supposed toponym Goatha has also been identified, by Ferguson (1847), with the location called Goʿah (גֹּעָה) in Jeremiah 31:39, in a description of the geography of Jerusalem. There is no consensus as to the location of the site. John (John 19:20) describes the crucifixion site as being "near the city". According to Hebrews (Hebrews 13:12), it was "outside the city wall". Matthew 27:39 and Mark 15:29 both note that the location would have been accessible to "passers-by". 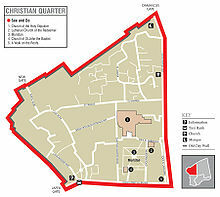 Thus, locating the crucifixion site involves identifying a site that, in the city of Jerusalem some four decades before its destruction in AD 70, would have been outside the city walls and well visible to passers-by. 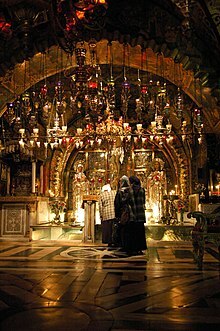 Christian tradition since the 4th century has favoured a location now within the Church of the Holy Sepulchre. This places it well within today's Jerusalem's Old City Walls, which were built in the 16th century. Proponents of the traditional Holy Sepulchre location point out at the fact that 1st-century Jerusalem had a different shape and size from the 16th-century city, leaving the church's site outside the pre-AD 70 city walls. Those opposing it doubt this. Defenders of the traditional site have argued that the site of the Church of the Holy Sepulchre was only brought within the city limits by Herod Agrippa (41–44), who built the so-called Third Wall around a newly-settled northern district, while at the time of Jesus' crucifixion around AD 30 it would still have been just outside the city. Henry Chadwick (2003) argued that when Hadrian's builders replanned the old city, they "incidentally confirm[ed] the bringing of Golgotha inside a new town wall." In 2007 Dan Bahat, the former City Archaeologist of Jerusalem and Professor of Land of Israel Studies at Bar-Ilan University, stated that "Six graves from the first century were found on the area of the Church of the Holy Sepulchre. That means, this place [was] outside of the city, without any doubt…", thus maintaining that there are no scientific, archaeological grounds for rejecting the traditional location for Calvary. Some Protestant advocates of an alternative site claim that a wall would imply the existence of a defensive ditch outside it, so an earlier wall couldn't be immediately adjacent to the Golgotha site, which, combined with the presence of the Temple Mount, would make the city inside the wall quite thin. Essentially, for the traditional site to have been outside the wall, the city would have had to be limited to the lower parts of the Tyropoeon Valley, rather than including the defensively advantageous western hill. Since these geographic considerations imply that not including the hill within the walls would be willfully making the city prone to attack from it, some scholars, including the late 19th century surveyors of the Palestine Exploration Fund, consider it unlikely that people would build a wall that cut the hill off from the city in the valley. However, archaeological digs within the Church of the Holy Sepulchre proved the existence of six graves from the first century on the area of the church, placing it outside the city area and casting doubt on the "Strategic Weakness" and "Defensive Ditch" hypotheses. Joan Taylor supports a location inside the Old City, east of Jaffa Gate, southwest of the David and Habad Street junction, but still north of St Mark's Street. She considers that canonical as well as apocryphal Gospels, in connection with the known history and archaeology of Aelia Capitolina and Byzantine Jerusalem, together with the works of Melito of Sardis and Eusebius, indicate that Golgotha was the name of an area created by a large First Temple Period quarry, and not just of the crucifixion site, the latter of which she locates at the southern margin of this area. At the same time, Taylor supports the traditional location of the tomb. Disc marking traditional place, under the altar, where Jesus' cross stood. In Nazénie Garibian de Vartavan's doctoral thesis, now published as La Jérusalem Nouvelle et les premiers sanctuaires chrétiens de l’Arménie. Méthode pour l’étude de l’église comme temple de Dieu, she concluded, through multiple arguments (mainly theological and archaeological), that the true site of Golgotha was precisely at the vertical of the now buried Constantinian basilica's altar and away from where the traditional rock of Golgotha is situated. The plans published in the book indicate the location of the Golgotha within a precision of less than two meters, below the circular passage situated a metre away from where the blood stained shirt of Christ was traditionally recovered and immediately before the stairs leading down to "St. Helena's Chapel" (the above-mentioned mother of Emperor Constantine), alternatively called "St. Vartan's Chapel". Jerusalem after being rebuilt by Hadrian. Two main east–west roads were built rather than one. Prior to Helena's identification, the site had been a temple to Aphrodite. Constantine's construction took over most of the site of the earlier temple enclosure, and the Rotunda and cloister (which was replaced after the 12th century by the present Catholicon and Calvary chapel) roughly overlap with the temple building itself; the basilica church Constantine built over the remainder of the enclosure was destroyed at the turn of the 11th century, and has not been replaced. Christian tradition claims that the location had originally been a Christian place of veneration, but that Hadrian had deliberately buried these Christian sites and built his own temple on top, on account of his alleged hatred for Christianity. There is certainly evidence that circa 160, at least as early as 30 years after Hadrian's temple had been built, Christians associated it with the site of Golgotha; Melito of Sardis, an influential mid-2nd century bishop in the region, described the location as "in the middle of the street, in the middle of the city", which matches the position of Hadrian's temple within the mid-2nd century city. Romans typical built a city according to a Hippodamian grid plan—a North-South arterial road, the Cardo (which is now the Suq Khan-ez-Zeit), and an East-West arterial road, the Decumanus Maximus (which is now the Via Dolorosa). The forum would traditionally be located on the intersection of the two roads, with the main temples adjacent. However, due to the obstruction posed by the Temple Mount, as well as the Tenth Legion encampment on the Western Hill, Hadrian's city had two Cardo, two Decamanus Maximus, two forums, and several temples. The Western Forum (now Muristan) is located on the crossroads of the West Cardo and what is now El-Bazar/David Street, with the Temple of Aphrodite adjacent, on the intersection of the Western Cardo and the Via Dolorossa. The Northern Forum is located north of the Temple Mount, on the junction of the Via Dolorossa and the Eastern Cardo, adjacent to the Temple of Jupiter Capitolinus intentionally built atop the Temple Mount. Another popular holy site that Hadrian converted to a pagan temple was the Pool of Bethesda, possibly referenced to in the fifth chapter of the Gospel of John, on which was built the Temple of Asclepius and Serapis. While the positioning of the Temple of Aphrodite may be, in light of the common Colonia layout, entirely unintentional, Hadrian is known to have concurrently built pagan temples on top of other holy sites in Jerusalem as part of an overall Romanization policy. Archaeological excavations under the Church of the Holy Sepulchre have revealed Christian pilgrims' graffiti, dating from the period that the Temple of Aphrodite was still present, of a ship, a common early Christian symbol and the etching "DOMINVS IVIMVS", meaning "Lord, we went", lending possible support to the statement by Melito of Sardis asserting that early Christians identified Golgotha as being in the middle of Hadrian's city rather than outside. During 1973–1978 restoration works and excavations inside the Church of the Holy Sepulchre and under the nearby Muristan, it was found that the area was originally a quarry, from which white Meleke limestone was struck; surviving parts of the quarry to the north-east of the chapel of St. Helena are now accessible from within the chapel (by permission). Inside the church is a rock, about 7 m long by 3 m wide by 4.8 m high, that is traditionally believed to be all that now remains visible of Golgotha; the design of the church means that the Calvary Chapel contains the upper foot or so of the rock, while the remainder is in the chapel beneath it (known as the tomb of Adam). Virgilio Corbo, a Franciscan priest and archaeologist, present at the excavations, suggested that from the city the little hill (which still exists) could have looked like a skull. During a 1986 repair to the floor of the Calvary Chapel by the art historian George Lavas and architect Theo Mitropoulos, a round slot of 11.5 cm (4.5 in) diameter was discovered in the rock, partly open on one side (Lavas attributes the open side to accidental damage during his repairs); although the dating of the slot is uncertain, and could date to Hadrian's temple of Aphrodite, Lavas suggested that it could have been the site of the crucifixion, as it would be strong enough to hold in place a wooden trunk of up to 2.5 metres (8 ft 2 in) in height (among other things). The same restoration work also revealed a crack running across the surface of the rock, which continues down to the Chapel of Adam; the crack is thought by archaeologists to have been a result of the quarry workmen encountering a flaw in the rock. Based on the late 20th century excavations of the site, there have been a number of attempted reconstructions of the profile of the cliff face. These often attempt to show the site as it would have appeared to Constantine. However, as the ground level in Roman times was about 4–5 feet (1.2–1.5 m) lower and the site housed Hadrian's temple to Aphrodite, much of the surrounding rocky slope must have been removed long before Constantine built the church on the site. The height of the Golgotha rock itself would have caused it to jut through the platform level of the Aphrodite temple, where it would be clearly visible. The reason for Hadrian not cutting the rock down is uncertain, but Virgilio Corbo suggested that a statue, probably of Aphrodite, was placed on it, a suggestion also made by Jerome. Some archaeologists have suggested that prior to Hadrian's use, the rock outcrop had been a nefesh - a Jewish funeral monument, equivalent to the stele. The Itinerarium Burdigalense speaks of Golgotha in 333: "... On the left hand is the little hill of Golgotha where the Lord was crucified. About a stone's throw from thence is a vault (crypta) wherein His body was laid, and rose again on the third day. There, at present, by the command of the Emperor Constantine, has been built a basilica, that is to say, a church of wondrous beauty," Cyril of Jerusalem, a distinguished theologian of the early Church, and eyewitness to the early days of Constantine's edifice, speaks of Golgotha in eight separate passages, sometimes as near to the church where he and his listeners assembled: "Golgotha, the holy hill standing above us here, bears witness to our sight: the Holy Sepulchre bears witness, and the stone which lies there to this day." And just in such a way the pilgrim Egeria often reported in 383: "… the church, built by Constantine, which is situated in Golgotha …" and also bishop Eucherius of Lyon wrote to the island presbyter Faustus in 440: "Golgotha is in the middle between the Anastasis and the Martyrium, the place of the Lord's passion, in which still appears that rock which once endured the very cross on which the Lord was. ", and Breviarius de Hierosolyma reports in 530: "From there (the middle of the basilica), you enter into Golgotha, where there is a large court. Here the Lord was crucified. All around that hill, there are silver screens." (See also: Eusebius in 338). In 1842, heavily relying on the research of Edward Robinson, a German theologian and biblical scholar from Dresden named Otto Thenius was the first to publish a proposal that the rocky knoll north of Damascus Gate was the biblical Golgotha. In 1882–83, Major-General Charles George Gordon endorsed this view, and subsequently the site has sometimes been known as Gordon's Calvary. The location, usually referred to today as Skull Hill, is beneath a cliff that contains two large sunken holes, which Gordon regarded as resembling the eyes of a skull. He and a few others before him believed that the skull-like appearance would have caused the location to be known as Golgotha. Nearby is an ancient rock-cut tomb known today as the Garden Tomb, which Gordon proposed as the tomb of Jesus. The Garden Tomb contains several ancient burial places, although the archaeologist Gabriel Barkay has proposed that the tomb dates to the 7th century BC and that the site may have been abandoned by the 1st century. Eusebius comments that Golgotha was in his day (the 4th century) pointed out north of Mount Zion. While "Mount Zion" was used previously in reference to the Temple Mount itself, Josephus, the first-century AD historian who knew the city as it was before the Roman destruction of Jerusalem, identified Mount Zion as being the Western Hill (the current Mount Zion), which is south of both the Garden Tomb and the Holy Sepulchre. Eusebius' comment therefore offers no additional argument for either location. See Joan Taylor's theory in the article's introduction and under Alternative theories. Another alternative location has been proposed by Rodger Dusatko, a missionary in Germany. He claims that the location of Golgotha is just outside the Lions Gate. All four Gospels use the Greek word 'Kranion' to describe the place where Jesus was crucified. Unlike Skufion (skull), Kranion (in English - cranium)  is the upper part of the skull excluding the face bones. Since the temple faced east, the curtain in front of the entrance of the temple would have been in direct view of those gathered on this mount at the northeast corner of the Temple Mount, just outside the city wall. And to testify that the curtain ripped at the very moment when Jesus died, there must have been eyewitnesses. The Gospel of John refers to Golgotha as being very near the city, so near that all who passed by could read the inscription[19:20]. Considering also the prophecy in Psalms 69:12[69:12], his place of crucifixion would have been near enough to the gate that Jesus could hear what the people were saying about him there. And just as Eusebius comments in Onomasticon concerning Golgotha as being a hill just outside Jerusalem, north of the ancient Mount Zion, this hill fits his description. ^ e.g. Johannem Luzac, Institutiones ad fundamenta linguæ Hebrææ (1737), p. 334; Joseph Francis Thrupp, Antient Jerusalem (1855), p. 272 (fn 1). ^ a b Lande, George M. (2001) . Building Your Biblical Hebrew Vocabulary Learning Words by Frequency and Cognate. Resources for Biblical Study 41. Atlanta: Society of Biblical Literature. p. 115. ISBN 1-58983-003-2. Strong's Concordance H1538. ^ Chisholm, Hugh, ed. (1911). "Calvary" . Encyclopædia Britannica (11th ed.). Cambridge University Press. ^ a b c d Taylor, Joan (Spring 2002). "Golgotha: A Reconsideration of the Evidence". Bible and Spade. Associates for Biblical Research. Retrieved 27 July 2018. ^ Da Halgan Godspel on Englisc ed. Thorpe (1842), p. 176. ^ Luther in this diverges from the pre-Lutheran Lübeck translation, which like Wycliffe retains Latin calvarie. Biblia, Lübeck, 1494 (Bayerischen Staatsbibliothek Rar. 880, p. 430). ^ a b c Mount Calvary. Catholic Encyclopedia. Vol. III. New York: Robert Appleton Company. 1908. ^ Strong's Concordance H1601 "Goah, a place near Jerusalem:—Goath." ^ James Fergusson, An Essay on the Ancient Topography of Jerusalem (1847), 80f. Ferguson in this disagrees with Krafft, who identified the Goath of Jeremiah with the Gennath Γεννάθ of Josephus, i.e. the "garden gate" to the west of the Temple mount. ^ Chadwick, H. (2003). The Church in Ancient Society: From Galilee to Gregory the Great. Oxford: Oxford University Press. p. 21. ISBN 0-19-926577-1. ^ Garibian de Vartavan, N. (2008). La Jérusalem Nouvelle et les premiers sanctuaires chrétiens de l’Arménie. Méthode pour l’étude de l’église comme temple de Dieu. London: Isis Pharia. ISBN 0-9527827-7-4. ^ a b c Ball, Warwick. Rome in the East: The Transformation of an Empire. p. 294. ^ Clermont-Ganneau, Charles. Archaeological researches in Palestine during the years 1873-1874. ^ Nave New Advent encyclopedia, accessed 25 March 2014. ^ Ship as a Symbol of the Church (Bark of St. Peter) Jesus Walk, accessed 11 February 2015. ^ "Ship hangs in balance at Pella Evangelical Lutheran Church". Sidney (Montana) Herald. 10 June 2008. Retrieved 3 January 2016. ^ Clermont-Ganneau, Charles. Archaeological researches in Palestine during the years 1873-1874. p. 103. ^ a b Hesemann, Michael (1999). Die Jesus-Tafel (in German). Freiburg. p. 170. ISBN 3-451-27092-7. ^ Hesemann 1999, pp. 171-172:"....Georg Lavas and ... Theo Mitropoulos, ... cleaned off a thick layer of rubble and building material from one to 45 cm thick that covered the actual limestone. The experts still argue whether this was the work of the architects of Hadrian, who aimed thereby to adapt the rock better to the temple plan, or whether it comes from 7th century cleaning....When the restorers progressed to the lime layer and the actual rock....they found they had removed a circular slot of 11.5 cm diameter". ^ Vatican-magazin.com, Vatican 3/2007, page 12/13; Vatican 3/2007, page 11, here page 3 photo No. 4, quite right, photo by Paul Badde: der steinere Ring auf dem Golgothafelsen. ^ abela, john. "Bordeaux Pilgrim - Text 7b: Jerusalem (second part)". ^ "NPNF2-01. Eusebius Pamphilius: Church History, Life of Constantine, Oration in Praise of Constantine - Christian Classics Ethereal Library". ^ Bill White, A Special Place: The Story of the Garden Tomb (1989). ^ "East orientation of Jewish temples and altars".